Yup, this feels like about the right amount of torture! We (we being Pete and I as well as a bunch of friends and some of you guys!) are in the midst of our 12th day on Whole30 and I would give almost anything to be floating on a bed of these crispy Beer Battered Onion Rings. Our trip to Mexico also inspired the spicy Jalapeno Ketchup too, which is the perfect sweet and spicy dip for these perfect crispy rings! Set a deep, heavy pot filled half way with vegetable oil over medium-high heat. Fit the pot with a thermometer and carefully watch the oil as it comes up to 375 degrees. While the oil is heating, make the batter. In a large bowl start with 1 cup rice flour, then add the onion powder, cayenne and kosher salt. Whisk in the beer and then add the remaining ½ cup of rice flour a little at a time until you have a smooth batter that is thick enough to coat the onions, but still has some give to it (just not too runny.) I always think it’s like a medium pancake batter. When the oil is hot gently place the jalapeno in the oil and let it fry until golden brown on the outside and tender, about 2 minutes. Add the jalapeno to a mini food processor or blender with the ketchup and puree until pretty smooth. Transfer to a small bowl. Dip the onion rounds in the batter, making sure you have a thick coating on the onions. 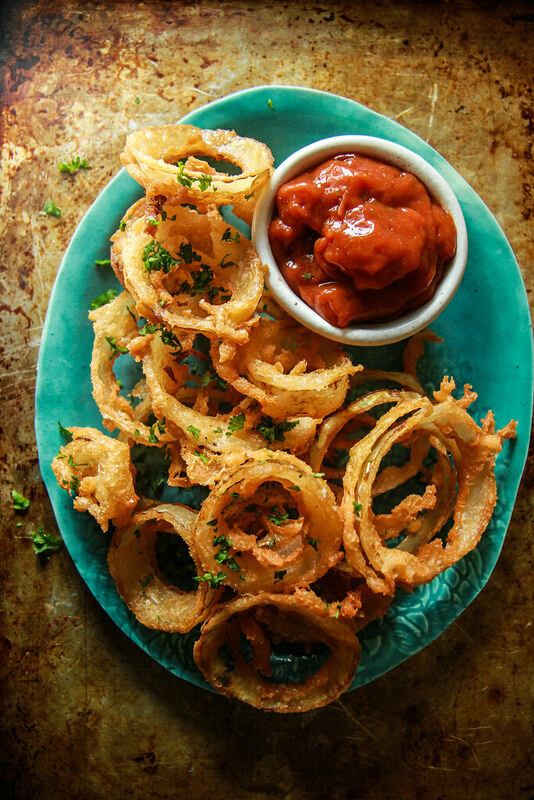 Gently place each battered onion ring into the hot oil, adding 5-7 rounds at a time so you don’t overcrowd the pot. You will have to watch the heat carefully, adjusting as needed. I don’t like to let my oil get below 350 degrees or above 375 degrees. That is why we don’t overcrowd the pot with onion rings all in one go, and why it is good to stir the oil with a slotted spoon while the rings are frying. When the onion rings are finished, pull them out with a slotted spoon (I use a Chinese Spider) and transfer to a sheet pan lined with paper towels. Immediately sprinkle with kosher salt. Then continue frying in batches until all of the rings are cooked. Serve hot with the Jalapeno Ketchup for dipping. They are perfect looking! And that sweet and spicy jalapeño ketchup – gotta try it! lol Sophie! I have no idea where that came from! So sorry- I will fix that asap. A favorite indulgence of mine! 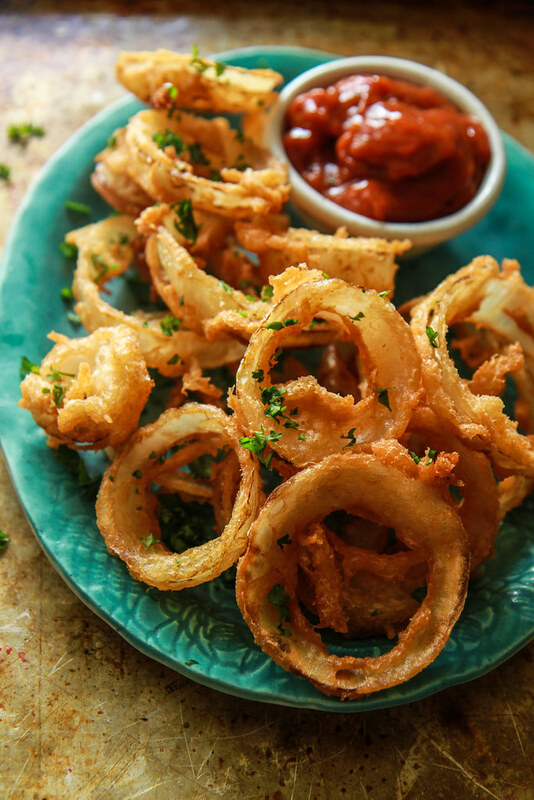 My mouth is watering over these onion rings! Delish!